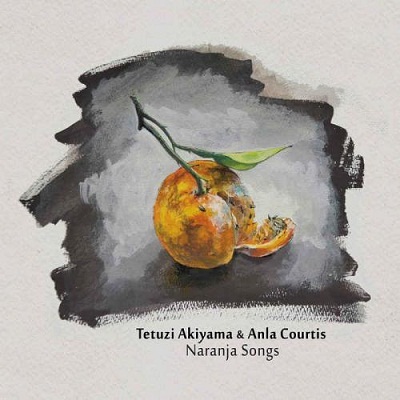 ‘Naranja Songs’ is certainly a wondrous and delicate work, given from the hands of Anla Courtis and Tetuzi Akiyama and released in a lovely Digipack by Public Eyesore records. In it, four tracks offer different and remarkable ways of how acoustic guitars can be made to produce intelligent, surprising and non conventional works of music. “Mind Mochileros” begins with a minimal duet where Akiyama and Courtis’ guitars paint an imaginary dialogue between bass lines and harp chords. The next tracks offer a much more experimental approach. My favorite part is certainly “Springs & Strings”, where unsettling metallic drones are emitted and then transformed into a chaotic spring box going out of control. ‘Naranja Songs’ shifts from an almost traditional guitar playing into deep experimental and alien chants as easily and naturally as humanly possible. Tetuzi Akiyama and Anla Courtis offer a modest and delicate work of art, yet for an uninvolved bystander like me, this is a beautiful spectacle of rich, brittle sounds.